How Big Do Jug Dogs Get? For some people they feel having their dog sleep outside in a dog house is the best option for them. There are many solutions to some issues people have with keeping their pets indoors but we understand there are a variety of reasons why you may want to use an outdoor dog house. One of the main issues dog owners then face is insuring their dog house is warm enough for their furry friend in the winter. We have gathered 10 tips to make your dog house warmer. 2. Raise the dog house off the ground. 3. Get rid of any draughts. 4. Carpets and rugs inside or a heated kennel pad. 5. Weatherproof and waterproof the exterior. 6. Place the dog house away from direct wind. 7. Dogs beds and plenty of bedding. 10. Buy a ready made insulated dog house. The first step to take to making your dog house warmer is to insulate it to help keep the heat in and prevent the temperature dropping inside the house at night. You could purchase a dog house with already insulated walls. Alternatively you can insulate your dog house yourself using thick weather-resistant foam sheets and a staple gun or glue. Begin by cutting your foam to the size of all 4 walls of the house and extra for the roof. If using glue, ensure it is weather-resistant and wait until the glue has fully dried and is no longer giving off fumes before the dog returns to their house. If using a staple gun you will need to be able to remover one of the walls to ensure none of the staples have gone through to the inside of the house as this could harm your dog. Raising the dog house will benefit your dog in several ways: firstly it minimises moisture and condensation from the floor of the house; it allows air circulation below the house and finally during rainy days and nights a raised dog house helps minimise the amount of mud and water getting into the house. Again, you can buy raised dog houses. Alternatively you can use concrete slabs under the house to keep it elevated off the ground. Begin by clearing the area where the house will go, cut the grass to create a smooth and flat base area, stack your concrete slabs, place your dog house back on top of the slabs. To ensure your dog is safe and warm enough in their outside home, you must minimise any existing draughts to help maintain a warmer temperature throughout the night. Begin by laying draught excluders around the base of the dog house to prevent the heat escaping though any gaps here. Then take a sheet of plastic, or a specific pvc kennel draught screen, and attach this to the inside of the entrance to your dog’s house. Again, if you use a staple gun to attach this then ensure there are no parts of the staple sticking out unsafely for your dog. A quick and easy way to insulate your dog house and keep you dog warm is to lay a rug or part of a carpet on the floor of your dog house. This simple addition will help keep the warmth in, be nicer for your dog to sit and lie on than the base of the house and reduce the cold outside air getting in. For a more luxurious dog house base, you could use a heated kennel pad on the floor of the house. This will be more expensive but definitely more effective in those winter months. We have already explored insulating the outside of your dog house with foam to help keep the heat in, but you may want to consider further additions to the exterior of your dog house to minimise the effects of the colder weather and rain on your dog. If possible, you could move the dog house under a roof or other shelter to prevent rain, hail sleet and snow from down into your dog’s house. Alternatively, you could add a waterproof sheet over the dog house and foam insulation as a way of reducing the effects of the weather and a further way to maintain the warmth inside. Do ensure there are gaps so that your dog is able to leave and return to the house easily. As alluded to above, the location of your dog house can minimise the impact of the weather and water on your dog’s house. Consider moving them closer to the house, beside a garage or shed or even in the corner of your garden so that two sides of the dog house are protected by fences. Each of these will help keep your dog house out of direct wind; which in turn will help to keep the dog house warmer in the winter. Another step to keeping your dog warm within their dog house is to invest in a sturdy and thick dog bed that they can get cosy on. 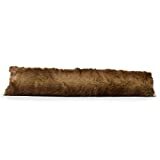 Blankets will also help to keep your dog warm in the cold winter months outside. These steps will again allow your dog to avoid direct contact with the base of their dog house which is often the coldest part of the dog house in winter. As we mentioned earlier about raising the dog house itself, another option is to raise the dog bed. Heat quickly disperses intothe ground so if your dog’s bed is raised within their house, less heat will escape from under them into the ground. Available in sizes - SMALL, MEDIUM and LARGE. Crafted using rust resistant coated stainless steel. Weave fabric encourages airflow beneath and through bed, perfect for those hot summer months! Raise your pet off the cold floor during winter months to prevent cold related aches and pains. Vets agree that indoor dogs should not be left outside when the temperature drops below 7.5 degrees Celsius. However we understand that for some dog owners it is not an option to bring your dog inside even on the coldest nights. In this case, you may want to invest in a heater for your dog house. There are heaters you can buy and attach to the inner walls of the dog house but please ensure these are high quality products that have passed all safety tests before putting them in your dog house to avoid potential fires. The best possible solution that covers all of our tips for keeping your dog house warm is to invest in a readymade insulated dog house. These are expensive but incorporate all elements that we have explored in the article: insulated walls, raised off the ground, weatherproof exterior and some have safe integrated heaters. If you are wanting to keep your dog outside during cold winter months, especially if their breed isn’t used to the cold, then we highly recommend investing in a purpose-built insulated dog house. Insulation to the Front, Back and 2 Side Panels (All 4 Panels). Insulation consists of timber (Treated Fir Wood) 1.25cm thick, then 1.3cm of Styrofoam, then 0.2cm of Plywood board. Keeps your Dog Warm in Winter and Cool in Summer. Walls 150% thicker than Non-Insulated kennels. 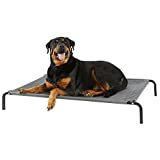 This is the largest Insulated Dog Kennel available on Amazon. The Cozy Pet Large Dog Kennel is the same size as the Pets Imperial XL Dog Kennel so if you look at the picture showing our new XL kennel next to our L kennel you will really see how much larger the new XL kennel is. 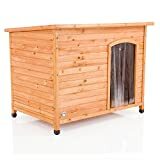 Overall if your dog being in your house isn’t an option for your family then a dog house becomes the logical next step. However, do ensure your pet is warm enough by following the tips we have outlined about. It can be expensive but knowing your dog is warm and protected from the elements certainly makes it a worthwhile investment. Do dogs feel the cold? Behind the website, we’re real people with real dogs who test all the products we review. You can check us out on Facebook, Instagram and Twitter and get to know us and our resident Jug Dog, Jeff! Should dogs and tortoises mix? Why does my dog stink after being outside? Why does my dog poop a lot? Previous post When can my baby play with a dog?